We wanted to give everyone a chance to get through the elections before asking you to vote once more, as we didn't want to get lost in the mudslinging between Republicans and Democrats. We already anticipate turmoil between the Crime fans (aka The Guilty Men) and the Horror fans (aka The Pigeons from Hell). Now that we've gotten past what is all but universally agreed upon as Thriller's last class act, we thought it was a safe time to ask you all to vote for your top ten favorite Thrillers (and order is important). If you have a different list of the best, or most important Thrillers, tuck that away for a rainy day. We're looking for your favorites to compile the results of the Thriller community's votes for the best of the best. Email your responses to our own Peter (who will type them up on his manual Smith-Corona, snail mail them to me for OCR scanning, importing into a spreadsheet and tabulation). Please send us your responses by next Monday, 11/8, in order for them to be counted. We'll post the results after we've run our review of the last episode. 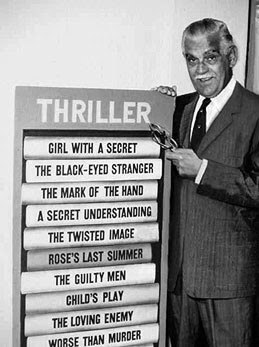 Excuse me, but you forgot "Favorite Thriller Stud." Please add. Oh, easy: LARRY PENNELL from "Late Date." Runner up: RON ELY from "Waxworks." See that, John? We get no respect! 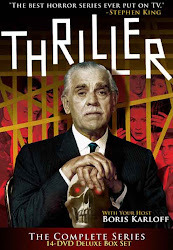 Favorite Thriller Stud category added. Damn, David was quick on the draw with his picks (not that there's anything wrong with that). Best Thriller Stud: Reta Shaw, "Til Death Do Us Part." I believe Reta would fall into the "Studette" category. I'm not surprised you fellas didn't notice the awesome pecs of Alejandro Rey on display throughout "La Strega." William Shatner is looking pretty handsome in his episodes, too. Richard Chamberlain is simply an Adonis. It's about time the Thrilling Men of Thriller got their due. I'd like to suggest going "One Step Beyond" for your next blog. I think you guys could have fun with that one. After some convalescence the dynamic duo probably should think about doing a 'HeyNowADay' Larry Sanders blog... One Step Beyond would be great, too, seeing if Newland wore that bathroom shammy in something else, or if it was a one-off only to reappear as Shatner's girdle. The insane half of this partnership actually (with a straight face, I assume) suggested our next foray should be "Dark Shadows." Dark Shadows is awesome! Unfortunately, purchasing the 26 Collections of discs, in addition to the 6 Collections of the beginning episodes (at prices ranging from $40-60 each), makes it a daunting task to find followers. If it weren't for that, I would fully support a Daily Dark Shadows blog. People should see Dark Shadows. It is a uniquely enjoyable experience for genre fans. I hope you can find a way to make that idea work some day, John. People thought Einstein was insane, too. Favorite thriller babe: Ursula Andress, followed closely by Audrey Dalton, Hazel Court and Elizabeth Montgomery. Special mention: Janet Lake (not for her acting), Adele Mara, Susan Oliver, Luciana Paluzzi, Danielle DeMetz, Patricia Medina, Patricia Barry, Sue Anne Langdon. I tend to think Hazel Court was the prettiest, Andress had the best body, Dalton was the cutest and Liz Montgomery is the quintessential pretty, nice girl next door with a little bit of mischief. I would have to rate Jeanette Nolan's role in La Strega as the best female performance. I liked Susan Oliver in Choose a Victim as well. Well of Doom is my favorite episode, followed by the Grim Reaper, La Strega, Dr. Markesan, Devil's Ticket, Hay Fork and Bill Hook, Yours Truly Jack the Ripper, Late Date and Choose a Victim.